Every scientific poll we’ve encountered so far suggests that voters thought Hillary Clinton beat Donald Trump in Monday night’s debate. In fact, some of them showed her winning by a wide margin — wide enough to make it a good bet (though not a guarantee) that she’ll gain in horse-race polls against Trump over the next week or so. But so far, we’ve seen just two polls released that tested Clinton’s standing against Trump after the debate. They have pretty good news for Clinton, but I’d recommend some caution until we get more data. The first poll is from Morning Consult, which shows Clinton leading by 3 percentage points in a matchup that includes third-party candidates — that’s a 4-point swing toward Clinton from the 1-point Trump lead that Morning Consult showed before the debate. In a head-to-head matchup against Trump, Clinton leads by 4 points, up from a 2-point lead before the debate. The other survey is from Echelon Insights, and it shows Clinton leading Trump by 5 percentage points. In theory, that would be consistent with a bounce for Clinton, since she led Trump by just 1 to 2 points overall before the debate, based on FiveThirtyEight’s projection. But it’s hard to know for sure because Echelon has surveyed the race only once before — just after the Republican convention, when they showed Clinton leading Trump by 1 point. Apart from these polls, the only other data we have is from the USC Dornsife/Los Angeles Times and UPI/CVOTER national tracking polls, but I’d discourage people from paying very much attention to them. It’s nothing against the polls themselves — in fact, I’ve defended the USC/LA Times poll’s methodology in the past — it’s just a matter of timing. Each poll uses a 7-day field period, which means that only about one-seventh of their interviews were conducted after the debate. I’d wait a couple of days before making too much of these surveys — until they consist mostly of post-debate interviews. There are other reasons to be cautious, too. Polls conducted over a one- or two-day period, like the Morning Consult and Echelon Insights polls, can suffer from low response rates, since the pollsters won’t have time to recontact voters who they missed the first time around. That could plausibly bias the poll toward whichever candidate has the most enthusiastic supporters at the time of the poll, making it less representative. Many traditional pollsters prefer their polls to be in the field for three or four days, and we won’t see any results from polls like those until Friday at the soonest. Another complication is that it can be hard to separate voters’ reaction to the debate itself from their reaction to the media’s reaction to the debate. By that I mean: Clinton has had some tough news cycles lately, so getting some better headlines could help her, and that could plausibly also affect the polls. Or maybe not, since Trump has a knack for turning the news cycle on its head. One last admonition: When evaluating a post-debate bounce, consider whether the poll was an outlier before. For instance, the most recent NBC/Wall Street Journal poll showed Clinton ahead by 6 percentage points nationally, on the high end of her range heading into the debate. By contrast, the most recent Rasmussen Reports poll had Clinton trailing Trump by 5 points. Clinton is more likely to improve her numbers in the next Rasmussen poll than in the next NBC poll, but that could reflect reversion to the mean as much as a debate bounce. Overall, there are some tentatively positive signs for Clinton — but not more than that, yet. At the moment, our polls-only model shows Clinton with a 58 percent chance of winning; polls-plus shows her with a 56 percent chance. But our forecast models don’t make any special assumptions about the debate, and they’ll take several days to catch up to whatever impact it has or hasn’t had. GOP senators say Trump should focus on the economy, not Bill Clinton's infidelities. Republican lawmakers have some advice for Donald Trump and his surrogates as they openly mull bringing up President Bill Clinton's infidelity at the next presidential debate: Don’t do it. GOP senators who’ve finally grown more comfortable with Trump warned in interviews Wednesday that descending into Bill Clinton’s sexual past is dangerous territory for the GOP nominee, who has his own less-than-pristine history when it comes to his commitment to the sanctity of marriage. Better to stick to, say, the economy, the pols suggested. His death was announced by his son Nehemya Peres, who is known as Chemi, and his personal physician and son-in-law Dr. Rafi Walden, outside the Sheba Medical Center, where he had been hospitalized for the last two weeks. Mr. Peres died just over two weeks after suffering a stroke. Doctors kept him largely unconscious and on a breathing tube since then in the hope that it would give his brain a chance to heal. But he deteriorated as the nation he once led watched his last battle play out publicly and as leaders from around the world sent wishes for his recovery. 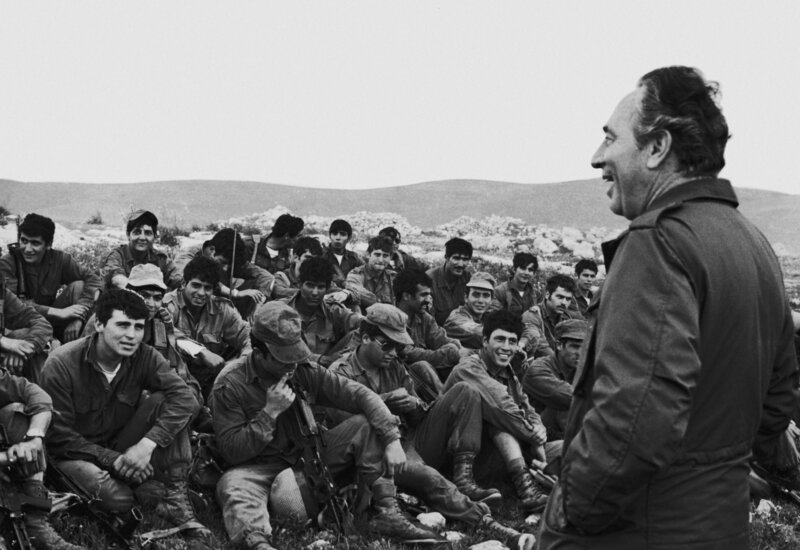 As prime minister (twice); as minister of defense, foreign affairs, finance and transportation; and, until 2014, as president, Mr. Peres never left the public stage during Israel’s seven decades. He led the creation of Israel’s defense industry, negotiated key arms deals with France and Germany and was the prime mover behind the development of Israel’s nuclear weapons. But he was consistent in his search for an accommodation with the Arab world, a search that in recent years left him orphaned as Israeli society lost interest, especially after the upheavals of the 2011 Arab Spring led to tumult on its borders. Chosen by Parliament in 2007 to serve a seven-year term as president, Mr. Peres had complicated relations with the hawkish government of Prime Minister Benjamin Netanyahu, elected in 2009. 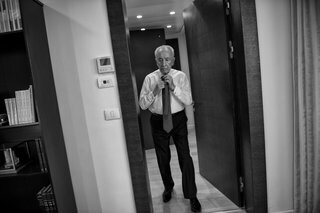 While largely a ceremonial post, the presidency afforded Mr. Peres a perch with access and public attention, and he tried to exert his influence. For someone who was dogged for decades by a reputation for vanity and back-room dealing, Mr. Peres ended his years in public office as a remarkably beloved figure, a founding pioneer who set an example for forward thinking by promoting the country’s high-tech prowess and cultural reach. In his efforts to help Israel find acceptance in a hostile region, Mr. Peres’s biggest breakthrough came in 1993, when he worked out a plan with the Palestine Liberation Organization for self-government in Gaza and in part of the West Bank, both of which were occupied by Israel. After months of secret negotiation with representatives of the P.L.O., conducted with the help of Norwegian diplomats and intellectuals, Mr. Peres persuaded his old political rival Yitzhak Rabin, then the prime minister, to accept the plan. It became known as the Oslo Accords. Mr. Peres, who was serving as foreign minister, signed the accords on Sept. 13, 1993, in a ceremony on the South Lawn of the White House as Mr. Rabin and their old enemy Yasir Arafat, the chairman of the P.L.O., looked on and, with some prodding by President Bill Clinton, shook hands. It was a gesture both unprecedented and historic. Up to that time, Israel had refused to negotiate directly with the P.L.O. Mr. Peres broke the taboo, and the impasse. Later that day, in a television interview, Mr. Peres pronounced himself 100 percent sure that peace had arrived. With the changes in the world — the end of the Cold War; the collapse of the Soviet Union and with it its military, financial and diplomatic support of the P.L.O. ; and the drying up of funds from Arab countries angered over Arafat’s support of Iraq in the recent Persian Gulf war — the time had come for the Palestinians, too, to seek peace. Mr. Peres, Mr. Rabin and Arafat were awarded the Nobel Peace Prize in 1994. But the era of good feelings did not last. Barely a year later, Mr. Rabin was assassinated by a Jewish gunman upset by the accords; the death elevated Mr. Peres to the post of prime minister. But a series of Palestinian suicide bombings undercut Mr. Peres’s authority, and he lost a narrow election to Mr. Netanyahu in 1996. It did not end until Arafat died in 2004, bringing new leadership to the Palestinians and a new effort at coexistence led by Mr. Sharon, a former hawk who had been elected prime minister. He withdrew Israeli settlers and soldiers from Gaza and small parts of the West Bank. Mr. Peres had tried before to get a peace settlement, in 1987, between Israel and Jordan. He was foreign minister in a coalition government with Yitzhak Shamir when he proposed an international peace conference on the Middle East. But Mr. Shamir and his Likud faction scuttled the plan. Mr. Peres became prime minister at the head of an unusual coalition of Israel’s two major political parties, his own Labor Party, and the Likud, the party led by Yitzhak Shamir, who served as deputy prime minister and foreign minister. In accordance with the coalition agreement, the two men exchanged posts after 25 months. Mr. Peres brought a period of tranquillity to the social environment, which had been frayed by animosities between European and Middle Eastern Jews and between religious Jews and secular Jews. He presided over the withdrawal of Israeli forces from Lebanon after an invasion that had generated unprecedented controversy, and he became the first Israeli prime minister to take the difficult steps required to deal with the nation’s fundamental economic problems and ruinous inflation. Taking over what was expected to be a government of national impasse, Mr. Peres left office with an image as a dignified, self-confident statesman. But while he was prime minister, severe strains developed in relations between the United States and Israel growing out of a major spy scandal involving an American, Jonathan Jay Pollard, and the disclosure in 1986 of Iranian arms deals. Mr. Peres was married to the former Sonya Gelman, who shunned the spotlight to the point of refusing to move into the president’s house when he took his last public post. She died in January 2011. 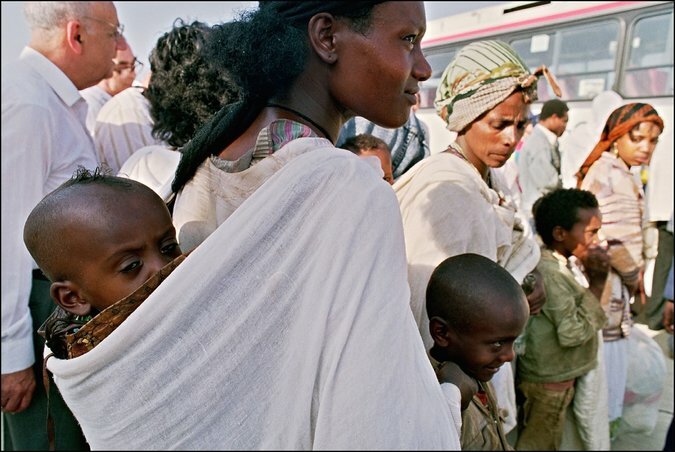 They had three children: a daughter, Zvia, and two sons, Jonathan and Nehemya. They and Mr. Peres’s eight grandchildren and three great-grandchildren survive him. Mr. Peres was an effective speaker, comfortable in front of large audiences as well as the television camera. He cultivated party members — remembering their names and attending their weddings and bar mitzvahs — and nurtured his relationship with the intelligentsia. He was born Shimon Persky on Aug. 16, 1923, to a merchant family in the small village of Vishniewa, Poland. His parents, Yitzhak and Sara Persky, took him to Palestine when he was 11, where he studied in Tel Aviv and then entered an agricultural school. In 1941, he helped found Kibbutz Alumot in the eastern Lower Galilee, where he worked as a herdsman and was elected kibbutz secretary. He soon became active in the Mapai, which was to become Israel’s Labor Party, and at 18 was appointed the coordinator of the youth movement of the Histadrut, the General Labor Federation. He rose rapidly, getting experience in the intricacies of Israeli political life. In 1944, Ben-Gurion, then the head of the Jewish Agency for Palestine, sent Mr. Peres with a small reconnaissance group to Eilat on the Red Sea to survey the Sinai Desert and make maps, which became important strategic assets during the 1948 war of independence. It was on that mission that a friend sighted a nest of eagles, “peres” in Hebrew. “Persky,” he said, “why don’t you change your family name to Peres?” He accepted the suggestion, though the bird they saw was in fact more a vulture than an eagle. When Israel became independent in 1948, Mr. Peres was named head of the naval service. Within two years, he was sent to the United States to lead a defense supply mission in New York. He was 27 and spoke no English, but within three months, after rounds of intensive private lessons, he was fluent. He took courses at the New School for Social Research and New York University, and later at the Harvard School of Public Administration. In 1951, Ben-Gurion, then prime minister and minister of defense, appointed Mr. Peres director general of the Defense Ministry, where he used his Harvard training to reorganize the department. Mr. Peres became known as one of “Ben-Gurion’s boys” — protégés of the “Old Man” — a group that included Teddy Kollek and Moshe Dayan. Those years may have been the genesis of a lifelong rivalry with Mr. Rabin, who at the time was chief of the operations branch, the second-highest position in the Israeli Army. He complained of what he called Mr. Peres’s excessive authority. At the Defense Ministry, Mr. Peres was in charge of a substantial portion of the nation’s total budget, and he played a central role in developing the young nation’s industry, particularly in aeronautics and electronics. He stressed domestic weapons production, but when Egypt received advanced military equipment from the Soviet Union and Czechoslovakia, Mr. Peres began to cast about for new sources of supply. He finally turned to France. His timing was excellent. The French believed the Algerian revolutionaries fighting for independence were fueled by President Gamal Abdel Nasser of Egypt and saw Israel as a source of intelligence about Egypt. Mr. Peres negotiated a $1 billion arms deal and acquired a reputation as a canny bargainer. Out of that joint venture came French help in building a nuclear reactor in Dimona, which provided Israel with the ability to build nuclear weapons. 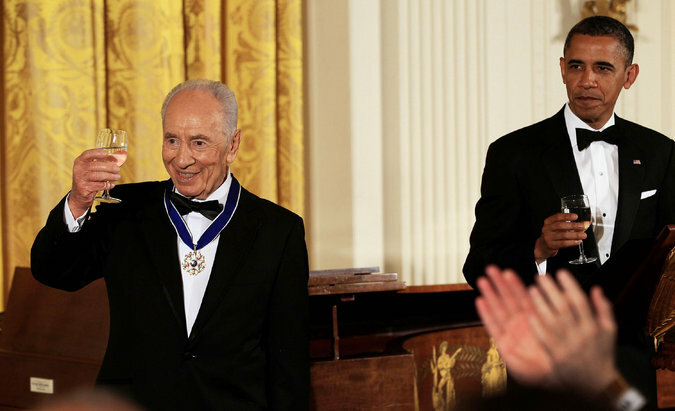 In 1957, Mr. Peres was awarded the French Legion of Honor, one of many international distinctions. In 2012, President Obama presented him with the Presidential Medal of Freedom. The American honor partly reflected Israel’s shift in alliance to the United States from Europe in previous decades. While under Ben-Gurion, and his successor, Levi Eshkol, Mr. Peres had negotiated with the West German defense minister, Franz Josef Strauss, to get arms and continued to get weapons from France as well. But he came to rely increasingly on the United States. He visited Washington frequently and met with Presidents John F. Kennedy and Lyndon B. Johnson. Mr. Peres ran for the country’s Parliament, the Knesset, in 1959, in his first bid for national elective office. With the support of Ben-Gurion, he was given a position high enough on his party’s electoral list to be assured of victory. Ten years later, in 1977, when Mr. Peres challenged Mr. Rabin, the split in the Labor Party opened the way for the election of Mr. Begin as prime minister. Their decades-old feud flared again in 1976 when an Air France plane that left Tel Aviv for Paris was hijacked in Athens and taken to Entebbe, Uganda. The hijackers held about 100 Israeli passengers hostage. 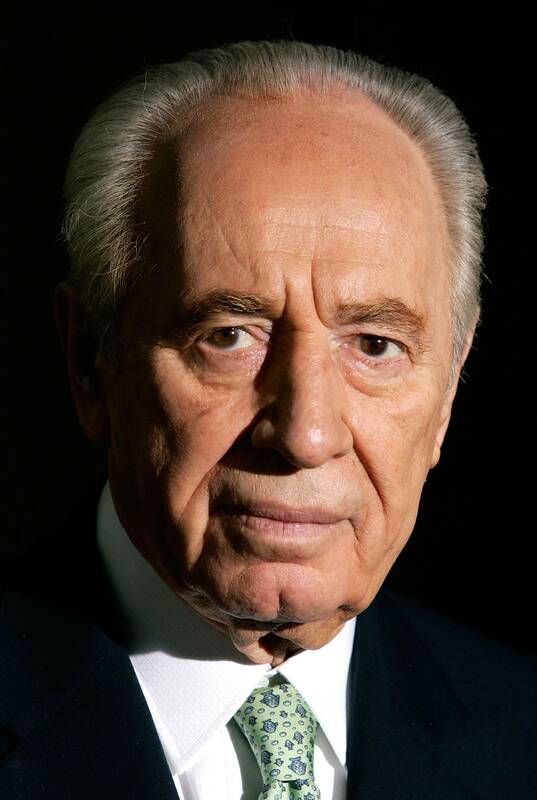 Mr. Peres accused Prime Minister Rabin of weakness for resisting a military solution. A raid by Israeli commandos on July 3, 1976, rescued 91 passengers and 12 crew members. The next year, Mr. Peres again sought nomination as his party’s candidate for prime minister, but he again lost out to Mr. Rabin. When Mr. Rabin was forced to drop out after disclosures that he and his wife had violated Israeli law by maintaining a bank account in Washington, Mr. Peres led the party, but he lost in the general election to Mr. Begin. 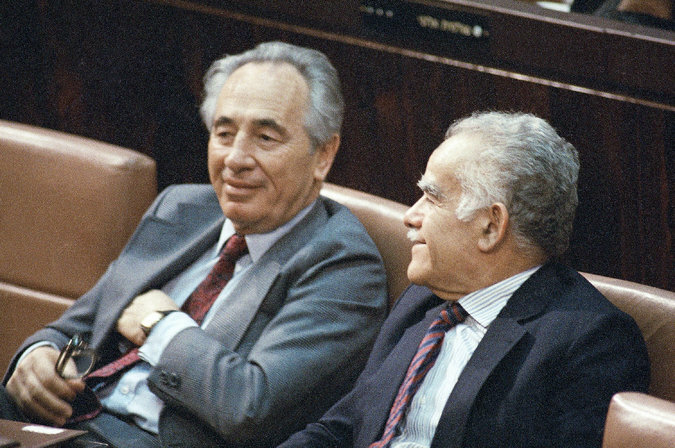 Mr. Peres finally became prime minister in 1984 when he led his Labor Party into the coalition with Likud. He returned to office as foreign minister in July 1992 in the government of Mr. Rabin and was soon working toward the accord signed a year later. In 1996, Mr. Peres, who had taken over as prime minister after Mr. Rabin’s assassination, called an early election, certain of victory. But a series of terrorist attacks in Tel Aviv and Jerusalem and Mr. Peres’s decision to mount an offensive against Hezbollah in southern Lebanon — during which scores of Lebanese refugees sheltering at a United Nations base in Qana died in an Israeli artillery barrage — led to ill feelings in Israel and the surprise victory by Mr. Netanyahu of Likud. Ehud Barak then replaced Mr. Peres as head of Labor and kept him in a minor role in his government, which was elected in 1999. 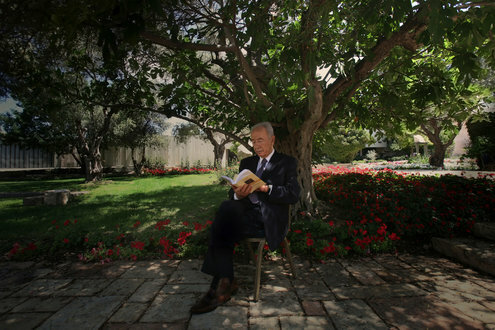 Mr. Peres spent that period partly building up his Peres Center for Peace but made another political comeback when Mr. Sharon was elected prime minister in 2001 over Mr. Barak. 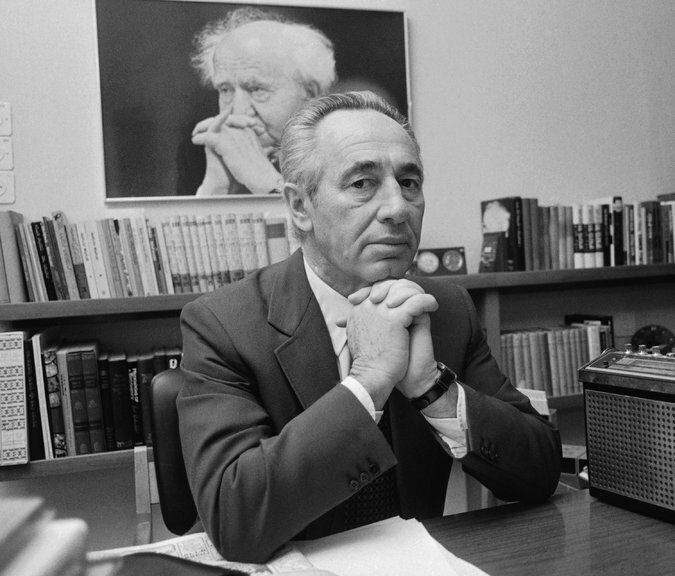 Mr. Peres took Labor into the Sharon-led government in a bid for national unity. Later, in 2005, he left Labor and joined the new centrist party, Kadima, formed by Mr. Sharon. If she doesn’t, Trump could be tough to beat. Democrats woke up on Monday to a spate of bad polls for Hillary Clinton, which brought Donald Trump to perhaps his closest position yet in the Electoral College. They had reason to go to bed feeling a lot better. Clinton bested Trump in the first presidential debate according to a variety of metrics, and the odds are that she’ll gain in head-to-head polls over Trump in the coming days. Start with a CNN poll of debate-watchers, which showed that 62 percent of voters thought Clinton won the debate compared to 27 percent for Trump — a 35-point margin. That’s the third-widest margin ever in a CNN or Gallup post-debate poll, which date back to 1984. The only more lopsided outcomes were the 1992 town hall debate between Bill Clinton, George H.W. Bush and Ross Perot — widely seen as a maestro performance by Clinton — and the first debate between Barack Obama and Mitt Romney in 2012, when the CNN poll showed a 42-point win for Romney and the horse-race polls moved in his favor in the following days. Post-debate surveys like CNN’s aren’t always popular with poll mavens, in part because the universe of debate-watchers may not match the electorate overall. The voters in CNN’s poll were Democratic-leaning by a net of 15 percentage points, for instance, a considerably wider advantage than Democrats are likely to enjoy on Election Day. The data is certainly noisy, but an emphatic win on the order of what Clinton or Romney achieved — and perhaps what Hillary Clinton achieved on Monday night — might be expected to produce a swing of 2 to 4 percentage points in horse-race polls. Even a 2-point gain would do wonders for Clinton, who would go from a fairly uncomfortable position in the Electoral College to a fairly comfortable one, and who would emerge with a 3-to-4-point lead in the popular vote. Of course, there’s not necessarily any guarantee she’d hold on to those gains — Romney didn’t in 2012. But let’s not get too far ahead of ourselves, and consider various aggravating and mitigating factors for Clinton in terms of her potential for an immediate post-debate bounce. On the mitigating side, as I mentioned, CNN’s poll had a Democratic-leaning sample. (On the other hand, if Democrats were more interested in watching the debate, that isn’t necessarily a bad thing for Clinton since she’s had trouble engaging her base.) Also, a separate post-debate poll from Public Policy Polling found Clinton winning by a narrower margin, 52-40. And historically, it’s the challenging party’s candidate, and not the incumbent’s, who gains after the first debate. But there are several other reasons to think Clinton could get a bounce, and perhaps a relatively meaningful one. In addition to the polls, a variety of post-debate indicators implied a Clinton win, including focus groups, betting markets, and the post-debate coverage on television networks. The TV coverage matters because the pundits’ reaction doesn’t always match that of voters in instant polls, and it’s sometimes the TV spin that wins out. Voters narrowly scored the first presidential debate of 2000 as a win for Al Gore, for instance, but after intense media focus on Gore’s demeanor, it was George W. Bush who eventually gained ground in polls. This time, pundits and pollsters seem to agree on the Clinton win. It’s certainly possible that by the time you’re reading this — I’m writing at 3 a.m. — some storyline that cuts against Clinton (and which didn’t seem like a big deal on Monday night) will have emerged. But the correlation between the instant-reaction polls and the eventual effect on horse-race polls has actually grown stronger in recent election cycles, perhaps because the conventional wisdom formulates itself more quickly. The effect of major campaign events has also tended to be magnified in 2016 because of the much larger number of undecided and third-party voters than we had in recent previous elections. Clinton got a large bounce of about 8 percentage points following her convention, for instance. There’s also an argument that Clinton is poised to rebound because the race was out of equilibrium — she’s led by about 5 points on average over the course of the campaign, as compared with just 1 or 2 points now — although it’s not clear how predictive that tendency is. What if Clinton doesn’t improve in the polls — or they even move toward Trump? Then that ought to be scary for Democrats, obviously. While Trump’s lack of preparation could also potentially cause him problems in the second and third debates, he showed off some of his worst qualities on Monday night, appearing to be the weaker leader than Clinton and less presidential than her, according to the CNN poll. If undecided and marginal voters were willing to shrug off Trump’s performance, then perhaps they really are in the mood for the sort of change that Trump represents, his faults be damned. But in general, Clinton has gained after the set pieces of the campaign, which reward her knack for planning and preparation, including her first primary debate against Bernie Sanders, her (anticlimactically) clinching the Democratic nomination on June 6 and 7, and the Democratic convention. Clinton doesn’t seem to have as much of an edge on her opponents in the daily free-for-all of the campaign. So if Trump and his advisors don’t like the post-debate storylines, they may try to create a distraction or two — something they’re uniquely skilled at doing. As a warning, you should give the debate five to seven days to be fully reflected in FiveThirtyEight’s forecasts. It will take a couple of days before reliable, post-debate polls are released, and then another couple of days before the model recognizes them to be part of a trend instead of potential outliers. Also, check the dates carefully on polls released over the next few days to make sure they were conducted after the debate. Although pollsters released dozens and dozens of polls over the weekend in anticipation of the debate, there are probably a few pre-debate stragglers that will slip through. Trump and Clinton debated how to grow jobs and incomes; Trump mentioned cutting regulation, while Clinton vowed to boost manufacturing jobs; both touted their tax and trade policies. But one proposal you didn’t hear in this debate tonight: universal basic income. With a UBI, the government regularly cuts a no-strings-attached check to each citizen. No conditions. No questions. Everyone, rich or poor, employed or out of work would get the same amount of money. While it sounds like socialism, some libertarians and Silicon Valley techies are rallying around the idea as a way to consolidate (and possibly cut) government programs while ushering in a future transformed by new technologies. I’m really surprised energy didn’t come up more often. But Trump did get in a dig about the risks of climate change towards the end. Which makes me want to bring up this chart from the Cooperative Institute for Climate and Satellites, which shows the temperature changes over the past 22 years in the United States alone. It’s also worth noting that climate change is going to have an impact on trade, one of Trump’s key issues. The World Trade Organization and the UN expect climate change to affect roads (because of permafrost melting) and ports (because of rising sea levels). Droughts could make rivers like the Rhine unnavigable. And all of that is going to raise the cost of international (and national) trade. Trump and Clinton argued about temperament. He said she didn’t act like a winner, and she said he was too easily baited. The latter claim is easier to settle tonight than the former. Trump kept up a running commentary while Clinton was speaking, although he seldom wrested the floor from her. He was much more likely to jump in when he was being discussed (whether it was his position on Iraq or the exact size of his fortune) than he was during discussion of racial tensions. During a discussion of nuclear defense, Trump says the U.S. is “losing” to Japan. It’s not clear what that means. On the economic front, Japan has been struggling for 20 years — the U.S. would almost certainly benefit if Japan’s economy picked up. And on trade, the U.S. has only a modest trade deficit with Japan. The very vague pre-announced topics made it hard to know what to expect tonight, substance-wise. In the end, we essentially got two debates: one on the economy and one on foreign policy, with a fairly extended discussion of crime in the middle. That left some surprising gaps: almost no discussion of immigration (Trump’s signature issue), health care (a huge topic during the last election) or energy (apart from Trump’s claim that the U.S. should have “taken the oil” from Iraq and Libya). Maybe they’ll come up more in the next debate. As the debate winds down, I’d like to go back to the question from earlier — who’s the audience for this debate? Given the unfavorable ratings for both candidates, it seems like one important audience is the type of voter who would like to vote for a major-party candidate but who doesn’t like Trump or Clinton. My sense is that this probably matters more for Trump than for Clinton. She’s a more conventional candidate, and we all know that there are a bunch of ways in which Trump is not — support from some party leaders has been hesitant (or nonexistent), and his policy positions, his history and his path to nomination have all been unusual. By this measure, Trump did pretty well. He interrupted a lot and made lots of statements that his opponents won’t like, but he didn’t do anything outrageous or different from what he’s done in the past. His statements were fluid. There was no steak salesmanship. It’s probably too early to say, but for a voter who doesn’t want to stay home or vote for a party they don’t normally support, this seems like the kind of performance that would allow you to pull the “R” lever. When looking at the instant post-debate polls, keep in mind that they can change. Back in 2000, Gore won the instant polls. It was Bush who gained in the polls, however, as the post-debate spin took place. Clinton brings up a Latina contestant in a beauty pageant who has now become an American citizen. Immigration has come up surprisingly little in this debate, considering how central the issue has been to the campaign overall. I haven’t heard Trump mention “the wall” even once. It looks like there will not be a single mention of health care during this debate. During the first presidential debate in 2012, Obamacare was mentioned by name 22 times. The shift in the conversation could be because the rate of uninsured is down in every congressional district in the country, and 20 million people gained insurance since the law was passed (29 million people are still uninsured). Or it could be because public perception of the law is as partisan as ever; the subject is a little tired. Trump said that Israeli Prime Minister Bibi Netanyahu is not “a happy camper.” Neither are some Jewish voters who support Israeli policy and question Obama’s policies on Israel — but Trump isn’t benefiting from that unhappiness, at least not financially. He’s getting a far smaller share of Jewish campaign donations to the two major-party nominees than Mitt Romney got in 2012. The old planes may be more reliable than new ones. An F-16 from the 1970s recently beat a shiny new F-35 in a dogfight. One thing that strikes me is that much of tonight’s debate was fought on territory traditionally considered masculine, like international relations and policing. Clinton did begin her debate night — and the entire debate — with a focus on gender issues beyond those that just affect women, like paid family leave. Clinton’s paid-leave plan includes time off for men, while Trump’s doesn’t. Gender is a bit of a scylla and charybdis for Clinton, as she navigates the traditionally masculine commander-in-chief role with the sometimes vicious anti-woman political memes saying she is not feminine enough. An analysis by Jason McDaniel and Sean McElwee for the Western Political Science Association found that “feminists” were among several groups toward which Trump supporters had less positive feelings compared to other Republicans and to the public at large. Clinton is a self-described feminist, but has also come under attack by both the left and the right regarding that claim. A 5 point swing isn’t really that much — equivalent to the polls moving by a net of half a percentage point or perhaps a point in Clinton’s direction. So bettor groupthink is very, very possible — and it’s also possible that we’re seeing the conventional wisdom become a self-fulfilling prophecy of sorts. But it’s also not all that large a move. Do you think those Betfair movements are a plausible representation of the real change in Clinton’s chances, or are bettors chasing each other? Could her win probability really have increased by 5 percentage points based on the debate so far? TRUMP: Would you like to hear — I was against the war — wait a minute. I was against the war in Iraq, just so you put it out. TRUMP: The record does not show — the record shows that I am right. So Trump has been called on his inconsistency and basically said, “Who are you going to believe, me or your lying eyes?” He’s gambling that enough voters will take his word over Holt’s. It’s a reminder that fact-checking is no panacea. Trump may think he has a better temperament than Clinton. According to a newly released Monmouth poll, only 35 percent of voters say Trump has the right temperament to be president. A much higher 58 percent say Clinton does. Terrorist attacks declined globally last year — but not in the West. Most terror attacks in 2015 occurred in the Middle East and North Africa — largely at the hands of ISIS, the Taliban and Boko Haram. But attacks in that region fell in 2015, bringing down the global total. In the West, however, terror attacks are up. The number rose in Western Europe, from 214 to 321, and in North America, from 34 to 62. During this debate, Clinton has accused Trump of lying without calling him a liar. She’s pointed viewers to a fact-checking page on her website and said things like, “If we’re actually going to look at the facts …,” and, “I know you live in your own reality, but that is not the facts” (both about NAFTA). Talking about fact checking sounds more neutral and objective than saying your opponent is lying. Despite Trump’s frequent use of his “Crooked Hillary” sobriquet in the past, he’s been more circumspect tonight. Actually, Trump’s favorability ratings among African-Americans compare — unfavorably — with bedbugs. He told Bryant Gumbel in 1989, “A well-educated black has a tremendous advantage over a well-educated white in terms of the job market. … If I was starting off today, I would love to be a well-educated black, because I really do believe they have the actual advantage today,” and he’s made many other racially questionable remarks between that year and today. This election season, while Trump has focused his attacks on Muslims and Mexicans, black Americans don’t seem to be buying what he’s selling. Clinton said we have to address criminal justice issues and can’t just “say law and order.” When the issue of race came up, Trump went straight into his law-and-order points. This phrase has a deep history in American politics — it was a key campaign phrase for George Wallace, who ran as an independent, pro-segregation candidate in 1968. The thing about this phrase in the 1960s was that it cast a wide net — it wasn’t just about race, but also Vietnam War protests and other counter-culture efforts to change the social order. The cultural significance of the term has now shifted — not least because of the way crime has become a dog whistle for race in electoral politics. As Trump pointed out, Democrats have been implicated in these politics as well. And now we’ve seen that play out in this debate in a slightly different way, as a question about race led very quickly into questions of incarceration politics, crime, and, law and order. In a recent article we spoke about the soft support of black millennials for Clinton, relative to older African-Americans. The twist: In a focus-group setting, many black millennials believed in Clinton’s messages about race and criminal-justice reform, two of their top issues, they just didn’t know about her long-term focus on fixing those problems. In 2011, New Yorkers were stopped by the police 685,724 times. 605,328 were totally innocent (88 percent). The report includes yearly statistics from 2002 to 2015. So far, the candidates have mostly traded personal accusations. By my count (according to a live transcript we’re using), the word “you” has been uttered 229 times in this debate. In the first debate between Romney and Obama in 2012 — where there was an incumbent president to accuse — there were 326 uses of “you” in the whole debate. In the first debate of 2008, with no incumbent president, there were 232. It surprises me that Trump’s go-to example of crumbling infrastructure is coastal international airports. LaGuardia, JFK and LAX just aren’t what many voters (particularly those in swing states) think of when they think of infrastructure problems. This strikes me as an example of him not speaking like a regular politician, for all that’s good and bad about that. The subject has turned to race relations. Americans think they are really bad. Over 70 percent of both black people and white people think race relations are generally bad, according to a July CBS News poll. That’s far worse than it was two years ago. Moreover, Clinton holds a large lead over Trump on race relations. If Clinton can keep the debate on this subject, she’ll be in good shape. Of course, it could be a good chance for Trump to cut into Clinton’s lead on the issue. “Trumped-up trickle-down” was Clinton’s first zinger of the night. Clinton went on to assert that independent experts said Trump’s tax plan “would blow up the debt by over $5 trillion and would in some instances disadvantage middle-class families, compared to the wealthy, were to go into effect, we would lose 3.5 million jobs and maybe have another recession.” Trump parried with his attack on NAFTA and the Trans Pacific Partnership, trade deals championed by Clinton’s husband, Bill Clinton, and her now-campaign surrogate, President Obama. “All you have to do is look at Michigan and Ohio … where so many of their jobs and companies are gone,” said Trump. During the primaries, Trump supporters were particularly strongly against trade agreements. Once Hillary Clinton taunted Donald Trump on his business record, the billionaire took the bait, and the debate shifted to a rowdy affair. The Republican nominee loses his cool as a composed Clinton hits him on his business record, the Iraq war, and his secret Islamic State plan. For 90 minutes at Hofstra University, Clinton and Trump clashed on style and specifics, disagreeing about foreign policy, economic plans and their readiness for the Oval Office. But for most of the evening, it was Clinton who was driving the agenda. She rattled off crisp prepared lines and repeatedly lured Trump into less politically favorable terrain, including a long discussion of why he was refusing to release his taxes. The much-hyped debate opened up with momentary niceties — Trump called her “Secretary Clinton, yes, is that okay?” — and a friendly handshake that briefly masked the tension of a knife’s edge contest that is well within the margin of error in the most crucial swing states. And in an unprecedented moment for presidential politics, the Democratic nominee midway through the debate accused the Republican nominee of racism. “He has a long record of engaging in racist behavior,” Clinton said, during an exchange on Trump’s years-long questioning of the American citizenship of President Barack Obama. The exchange was emblematic of a debate not deep on substantive policy differences but full of attacks, with both candidates landing blows that will resonate with their established bases of support. “I have a feeling that by the end of this evening I am going to be blamed for everything,” Clinton said with a smile. “Just join the debate by saying more crazy things,” Clinton shot back. Clinton seemed to gain steam as the debate went on, hitting Trump in the closing minutes for his past attacks objectifying women’s appearances. The former secretary of state often appeared relaxed as Trump scowled and tried to jump in during her answers. Clinton had prepared for weeks for the face-off with Trump, complete with briefing books and mock debates. Trump has eschewed such traditional preparation and, while he landed some of the evening’s most memorable lines, his performance was far more uneven. In one of the debate’s tenser moments, Trump swiped at Clinton’s recent time off the campaign trail when she came down with pneumonia and holed up for debate preparation. “You decided to stay home and that's okay,” Trump said with more than a hint of sarcasm. Under sustained attack, Trump did not have a meltdown, even as he misrepresented key elements on his record, including citing opposition to the war in Iraq despite the public record, and insisting that Clinton began raising questions of Obama’s citizenship. It was the evening’s most talked-about line both on Facebook and Twitter. Throughout, Trump stuck to knocking Clinton as a predictable, talking-point driven, lifelong politician. “Typical politician. All talk. No action. Sounds good. Doesn’t work. Never gonna happen,” Trump said in a staccato summation of his debate plan. The two candidates sniped about nearly everything from climate change to the economy to ISIS to trade to their records. One of the longest exchanges came not on tax policy — but Trump’s refusal to release his taxes, breaking decades of precedent for presidential candidates. Trump got a rise out of the audience – against the debate’s ground rules of silence from the crowd -- by pledging to release his tax returns if Clinton releases all of the emails her staff deleted from the private email server she used as secretary of state. “I will release my tax returns, against my lawyer's wishes, when she releases her 33,000 e-mails that have been deleted,” Trump declared. Clinton tried to turn the attack on her private email use back on Trump, who had previously said he wouldn’t release his tax returns until a routine audit is completed. “I think you've just seen another example of bait and switch here. For 40 years, everyone running for president has released their tax returns,” Clinton said. Clinton tried to direct viewers to her website for real-time fact-checking of Trump. Trump directed viewers there, too, at one point. “She tells you how to fight ISIS on her website. I don't think General Douglas MaCarthur would like that too much,” Trump said of the 20thcentury general. “At least I have a plan to fight ISIS,” Clinton said. “No, you're telling the enemy everything you want to do. No wonder you've been fighting ISIS your entire adult life,” Trump said about a group that has only existed for a few years. “The record shows otherwise,” Holt said. “The record shows that I’m right,” Trump said. Clinton more than once made accusations that caused Trump to blurt out interruptions, referring to him only by his first name. “Donald was one of the people who rooted for the housing crisis,” she said. “That’s called business,” Trump jumped in. And when she hit him for his rhetoric about failing black communities, he sighed audibly. More than anything, Clinton sought to make the evening a referendum on Trump’s truthfulness, even as polls show the public have many questions about her own trustworthiness. They went back and forth several times, but Clinton ultimately got the last word. Well, folks, this is getting tight. Donald Trump is in his strongest-ever position in MARCAPOLITICA’S polls-plus forecast, which gives him a 46 percent chance of winning the election. Trump’s chances are about the same, 45 percent, according our polls-only forecast, his best standing since it showed him with a 50 percent chance in the midst of his convention bounce. Our models have been on the move toward Trump for roughly six weeks. But with dozens of polls coming out over the past few days, he’s no longer much of an underdog at all. Hillary Clinton leads narrowly — by 1.5 percentage points — in our projection of the popular vote. But polling weakness in states that Clinton probably needs to win, particularly Colorado and Pennsylvania, makes the Electoral College almost even. On average, Clinton is ahead by only 1.3 percentage points in these polls — right where our forecast shows the race. And the trend lines are mostly negative for her, with Clinton polling an average of 2.6 points below the previous editions of the same polls. Meanwhile, here are the state polls we’ve added since Saturday. The list excludes the latest editions of the Ipsos/Reuters and CVOTER International 50-state tracking polls, which our model uses but assigns a relatively low weight. These tell pretty much the same story. On average among this weekend’s polls in what we consider swing states,1 Clinton leads by only 1.2 percentage points. And the trend has moved in Trump’s direction by an average of 2.9 percentage points. Again, that’s right in line with what our forecast shows. Unfortunately for Clinton, her state-by-state polls are configured in a way that makes her Electoral College position relatively vulnerable. Particularly problematic for Clinton were the numbers in Colorado, where two of the three new polls this weekend had her trailing Trump. A couple of those pollsters (Gravis Marketing and CNN) have Trump-leaning house effects, but still, it’s a close race there, and Clinton leads by only 1.6 percentage points in our Colorado forecast. Without Colorado in her column, Clinton would need to win a state that she currently appears to trail in, such as North Carolina or Florida. There were also five polls of Pennsylvania that showed Clinton ahead by only 1 to 3 points there. She leads in Pennsylvania by 2.4 percentage points in our forecast. Not every poll was bad for Clinton: She led fairly comfortably in two new polls of Virginia, although they showed negative trend lines for her. She got relatively good polls in Florida and Ohio. And as with any long list of polls, this one contained a mix of good and not-so-good pollsters. But there was no clear pattern of better pollsters showing better numbers for Clinton, or vice versa. For instance, the single poll that hurt Clinton the most in our forecast was a national survey from Selzer & Co. on behalf of Bloomberg Politics, which showed her trailing Trump by 2 percentage points. Selzer is one of our highest-rated pollsters and had shown strong numbers for Clinton earlier in the cycle. Recently, FiveThirtyEight has shown better better odds for Trump than other models have, for several reasons. First, our model is generally quicker to update than others, because of its use of the trend-line adjustment. That allows us to make inferences about how the polls are moving in every state, even when they haven’t been polled recently. For instance, the model correctly anticipated significant tightening in Colorado and Pennsylvania, even after we went a long stretch without many new polls there. A good test of whether a model is too conservative, too aggressive or “just right” is whether it does a good job of matching new polls as they come out in a state. So far in this election, the FiveThirtyEight and Daily Kos Elections model — which also uses a trend-line adjustment — have done a good job of this, while other models sometimes lag behind the trend. A good, related question is whether polls are mean-reverting. Clinton has generally led Trump by more than the 1 or 2 percentage point lead she has now. Does that mean she’s more likely to gain ground than to lose ground from this point onward? Our polls-only model makes no assumptions about this, instead taking the polls at face value. Polls-plus does account for mean reversion, but it assumes that polls revert toward a mean established by an index of economic conditions, rather than the long-term average of polls. Because economic conditions project a very close race right now, the polls-plus forecast is about the same as polls-only. One could argue for reverting polls toward a long-term average instead, as at least one other forecaster (Princeton Election Consortium) does. We’re not totally sold on the empirical case for this, but theoretically it’s perfectly sound: A model could have the race as a dead heat in the event of a hypothetical election held today but nonetheless have Clinton favored on Nov. 8. FiveThirtyEight’s models also generally account for more uncertainty than other models — or at least they do in this election because the presence of a large number of undecided and third-party voters, who contribute to polling volatility. That helps Trump’s odds, since he’s (narrowly) the underdog in our forecast. Another difference is whether one uses the version of the polls with third-party candidates included, as FiveThirtyEight’s forecasts do. Clinton’s leads are often slightly larger in two-way matchups. But those two-way matchups describe a hypothetical election — in actuality, Libertarian Gary Johnson will be on the ballot in every state, and the Green Party’s Jill Stein will be on the ballot in all but a handful of them. That’s why we prefer the version of the polls that include their names. It’s up to Clinton and Trump to earn those votes and not up to us to make assumptions about how those voters will behave. FiveThirtyEight’s models are faster to incorporate new data and identify trends than most others. For the time being, this helps Trump, since he’s been gaining in the polls. FiveThirtyEight’s models account for more uncertainty than most others. For the time being, this helps Trump, since he’s the underdog — although it potentially also means we give Clinton a better chance of a landslide than other models do. FiveThirtyEight’s models use the version of the polls that include third-party candidates. For the time being, this helps Trump, since he’s losing less to third-party candidates than Clinton is. None of these will necessarily help Trump permanently, however. It hasn’t always been the case that third-party candidates so disproportionately hurt Clinton, for instance. And if Clinton gains following the debates, FiveThirtyEight’s models will probably be among the quicker ones to detect it. For now, however, the polls show a very close race. Clinton leads in the majority of national polls, but not by much, and there are several that have Trump ahead. Likewise, she leads in the narrow majority of swing state polls, but there are many Trump leads in the swing state polls as well, and Clinton does not have clear leads in enough states to win the Electoral College. Therefore, the race is close. This ought to be clear whether you’re looking at relatively simple averages like those at RealClearPolitics or considering more complex methods like FiveThirtyEight’s. The stage is set for the first presidential debate between Hillary Clinton and Donald Trump, at Hofstra University in Hempstead, New York. Hillary Clinton and Donald Trump are about to face off in one of the most anticipated debates in American political history. Clinton generally got good reviews as a debater in her two runs for the presidency. Trump’s debate performances during the Republican primaries were … unconventional. I won’t try and predict who is going to “win” tonight’s debate. But if history is any guide (and it may not be in this crazy election year), Trump has more to gain from the first debate than Clinton, though we shouldn’t expect a major change in the polls. Eight out of 10 times, the non-incumbent party’s candidate — that’s Trump this year — gained in the polls after the first debate. That includes each of the last five times. There are various theories to explain this. Some people think, for instance, incumbent presidents do poorly in first debates because they’ve had four years to grow unaccustomed to being challenged so directly, or that the challenger benefits simply by being on an equal playing field with the sitting president. Those theories don’t apply this year. That said, there are other reasons to think Trump has more to gain. He is currently winning a lower percentage of self-identified Republicans than Clinton is getting Democrats, so perhaps he has more lower-hanging fruit than Clinton: More Republican voters may come home after seeing both Clinton and Trump in action. Another pattern that jumps out from the table above: First debates haven’t moved the polls all that much. Only twice did the leader change: Ronald Reagan moved ahead of Jimmy Carter in 1980 and won the election easily, and George W. Bush overtook Al Gore in 2000 and won the Electoral College (but not the popular vote). The average change in the margin between the two major-party candidates has been about 2.6 percentage points. Of course, with Clinton up by only 2 to 3 percentage points nationally, even a modest-sized Trump bounce could give him the lead. There are also a couple of factors at work this year which could allow the first debate to swing the polls more than usual. First, it could be that at a time when social media can cement a narrative within minutes, a good debate performance matters more than ever. The largest first-debate gain since 1976 occurred in 2012 when Mitt Romney picked up 4.4 percentage points and drew into a near tie with President Obama in national polls. Four years before that, in 2008, Obama expanded his lead over John McCain by nearly 3 points after the first debate. Second, there are an unusually large number of voters who are either undecided or favoring a third-party candidate at the moment. And the gains major-party candidates have made after previous debates have tended to come from those groups, rather than poaching the other nominee’s supporters. Even in 1980, when Reagan was deemed to have crushed Carter in their lone debate, Carter actually gained support after their meeting. Reagan simply gained more. That year, third-party candidate John Anderson was kept out of the debate, and we have an analogous situation this year: Neither Gary Johnson nor Jill Stein reached the 15 percent threshold to be included in tonight’s debate. So it wouldn’t be too surprising if both Clinton and Trump gained support in the polls after tonight’s meeting. This could be good news for Clinton, given that Johnson and Stein supporters tend to favor her when forced to choose between her and Trump. Remember, though, that there haven’t been that many campaigns featuring a debate and robust polling; we’re looking at only 10 to draw these conclusions, and that’s not a huge sample. And, moreover, there’s no guarantee that the gains a candidate makes after the first debate will stick. In 2012, Romney made up a ton of ground on Obama after the first debate, but those gains proved fleeting. In fact, the polls before the first debate, not just after, were far closer to the final outcome in 2012. Here’s one thing we do know, however: The clock is ticking. The first debate usually has a bigger impact than the other debates, whether because there is less time left for voters to decide or simply because voters have already been reintroduced to the candidates. Indeed, tonight’s debate may be the last chance for major movement in the polls — barring some external shock. If you look at the polls taken after the first debate and the final pre-election polls,2 the average difference is just 2.2 percentage points. The leader in the polls after the first debate was always the leader in the final polls. That means unless there is an October surprise, next week’s poll numbers will probably be close to the final standings. The best chance for the trailing candidate after that point is for the polls to be wrong (a real possibility), not for the polls to move. Whatever arguments we’ve had about the polls this week will soon be swamped by the reaction to Monday’s presidential debate. As a rough guide, I’d expect us to have some initial sense of how the debate has moved the numbers by Thursday or Friday based on quick-turnaround polls, and a clearer one by next Sunday or so, when an array of higher-quality polls will begin to report their post-debate results as well. But in the meantime, let’s take one more step back and ask our usual collection of 10 questions about where the presidential race stands. Think of these as time capsules of a sort; you can find previous editions here (July 15), here (Aug. 15) and here (Sept. 6). 1. Who’s ahead in the polls right now? Hillary Clinton, but tenuously. There were some semantic debates on Twitter this morning after ABC News and the Washington Post released their new national poll that showed Clinton 2 points ahead of Donald Trump. Did the Post convey the right impression in describing the race as a “virtual dead heat” in its headline? I might have chosen slightly different vocabulary: “Clinton has razor-thin advantage,” or something like that. But it’s basically correct, at least based on the FiveThirtyEight forecast, to characterize the election as both close and competitive. The ABC News/Post poll is typical of recent national polls, which have Clinton up by about 2 points on average. (That average includes some high-quality polls that have Clinton ahead by as many as 6 points, but also a handful of others that show Trump with a lead.) Meanwhile, in the Electoral College, Clinton is leading in the states she needs to win, but only in those states, and not by all that much. Trump is one string of good polls in Pennsylvania or Colorado or New Hampshire away from erasing that advantage. To put it another way, a narrow Trump win would not count as a major polling foul-up if the election were held today: It would be within a reasonable range of disagreement among pollsters. A clear Trump win — or for that matter, a Clinton landslide — would be more of a problem for the polls. With that said, Clinton is a pretty good bet at even-money. As of Sunday morning, she’s a 58 percent favorite according to both our polls-only and polls-plus models. 2. What’s the degree of uncertainty? It remains fairly high. This is the point that we really can’t emphasize enough, and it’s why FiveThirtyEight shows somewhat better odds for Trump than most other forecast models. Not all 2-point leads are created equal, and Clinton’s is on the less-safe side, certainly as compared with the roughly 2-point lead that President Obama had over Mitt Romney on the eve of the 2012 election. Perhaps the most important reason for that is the higher-than-usual number of undecided and third-party voters. Clinton leads Trump roughly 42-40, based on our national polling average; late in the 2012 race, by contrast, Obama led Romney about 48-46. That means about 18 percent of the electorate isn’t yet committed to one of the major-party candidates, as compared with 6 percent late in 2012.1 The number of undecided and third-party voters has a strong historical correlation with both polling volatility and polling error — and in fact, the polls have been considerably more volatile this year than in 2012. We also have a wider playing field of swing states this year — with states ranging from Georgia to Maine having been competitive at various points of the campaign. Thus, there’s a good chance that the polls (and the polling aggregators) will “call” several states wrong instead of getting 48 or 49 or 50 of them right, as they did in 2008 and 2012. That introduces important assumptions about how the errors between states are related. FiveThirtyEight’s model assumes these errors are somewhat correlated, especially in demographically similar states. If Trump beats his polls in Wisconsin, for example, he’s also likely to do so in Michigan. Finally, it can be easy to lose sight of the fact that we still have a fairly long way to go. With the party conventions held early this year, everyone’s sense of timing was thrown off, and the 44 remaining days in this campaign are going to feel like an eternity. It’s important to underscore that this uncertainty cuts in both directions. We give Trump better odds of winning than most other models, but we also assign higher odds to a Clinton landslide. 3. What’s the short-term trend in the polls? In the very short-term — i.e., what the polls look like as compared with a week ago — it’s not clear. Clinton had appeared to be regaining some ground on Trump, but the polls that came in over the weekend were middling for her, including surveys showing just a 1-point Clinton lead in Colorado and a 2-point lead in Pennsylvania. Whether these changes reflect voters reacting to events in the news cycle or are just random fluctuations is hard to say. 4. What’s the medium-term trend in the polls? It’s been toward Trump for a long time now. Clinton’s position peaked on Aug. 8 in the polls-plus model and Aug. 14 in polls-only. Trump has slowly and fairly steadily gained ground since then, closing his deficit by about 1 percentage point a week, to narrow Clinton’s lead from about 8 points in mid-August to 2 points now. 5. Which states shape up as most important? There’s not any one key state, which is part of the reason the election remains uncertain — and exciting. Instead, the various swing states are currently lined up on either side of a gap, with Clinton leading in states representing 272 electoral votes2 and Trump ahead in states totalling 266 electoral votes. If any of the states just to Clinton’s side of the gap slips toward Trump — Pennsylvania, Colorado, New Hampshire, Wisconsin and Michigan are the most plausible candidates — he’ll pull ahead in the Electoral College. But conversely, Trump leads by less than 1 percentage point in Florida and by barely more than that in North Carolina and if either of those were to fall to Clinton, his electoral math would become very difficult. The same is theoretically true for Ohio, although Trump’s lead has been more consistent there. 6. Does one candidate appear to have an overall edge in the Electoral College, relative to his or her position in the popular vote? It’s complicated. There could plausibly be an Electoral College-popular vote split in either direction, but our models say that Trump is somewhat more likely to benefit from this. Right now, Clinton is ahead by 2.0 percentage points in our national popular vote estimate. She’s also ahead by 2.8 percentage points in Colorado, which is currently the tipping-point state — the state that would give her just enough votes to win the Electoral College. That’s a potential advantage for Clinton, but it requires the polls to be pretty much exactly on the mark. By contrast, Clinton’s position overall in swing state polls has not been especially good, in part because they tend to have a high proportion of white working-class voters — Trump’s best group. In particular, she’s gotten some pretty awful numbers in Ohio, Iowa and Nevada lately, and her position in North Carolina seems to be worsening. If instead of treating Colorado as definitely being the tipping-point state, we instead weight the states by their probability of being the tipping-point state, Clinton’s lead over Trump is 1.2 percentage points in the average swing state, less than her national margin and therefore a potential Electoral College disadvantage for her. Basically, it’s a question of whether you’d rather have pretty good polling in exactly enough states to win 270 electoral votes, at the cost of pretty bad polling in the swing states overall. Our models say that isn’t a great trade-off for Clinton because having one good path leaves too little room for error. But this calculation is somewhat sensitive to our model’s assumptions. At a minimum, it’s another source of uncertainty. 7. How do the “fundamentals” look? Non-polling factors such as economic conditions suggest that a race between a “generic” Democrat and a “generic” Republican ought to be close. In that sense, it shouldn’t be hard to see how Trump could win. He either becomes normalized enough that he performs about the same as a generic Republican would, or he significantly underperforms a generic Republican but Clinton’s problems are just as bad. 8. How do FiveThirtyEight’s forecasts compare against prediction markets? In general, FiveThirtyEight’s polls-plus model has closely tracked betting markets — more closely than any other major forecast (including our own polls-only model). There’s a modest gap between them now. Whereas polls-plus gives Clinton a 58 percent chance and Trump a 42 percent chance, Betfair gives Clinton a 62 percent chance and Trump a 34 percent chance (reserving a 4 percent chance that someone other than Clinton or Trump somehow becomes the next president, a possibility that FiveThirtyEight’s models do not consider). For a variety of reasons, ranging from the fact that that gap isn’t all that large to that betting markets can plausibly account for some factors that FiveThirtyEight’s models don’t, I’m not sure about whether I think there’s enough edge there that I’d actually advocate laying money down on Trump. I suppose I wish there were a betting market open only to political journalists and commentators, though. My hard-to-prove sense is that they underrate Trump’s chances as compared with both betting markets and our forecasts. 9. What would keep me up late at night if I were Clinton? You mean, other than the fact that the election keeps getting closer every time I look? As I put it in July: “I’d be worried that Americans come to view the race as one between two equally terrible choices, instead of Trump being uniquely unacceptable.” In particular, I’d be worried that my brand has irrevocably been tarnished with a reputation for dishonesty. Between Trump’s knack for exploiting this weakness (“Crooked Hillary”), the news media’s tendency to frame events as contributing to my honesty and trust problems, and some left-over hard feelings from the primaries — Clinton has yet to win over many of the millennials who voted for Bernie Sanders — I’m generally losing when polls ask who the more trustworthy candidate is. In the short term, I’d be worried that the talk of Trump’s “low expectations” at the first debate is a tip-off that the media hivemind might frame a debate tie as a Trump win. 10. What would keep me up late at night if I were Trump? Trump’s concerns also aren’t all that different from those he had in July. If I were him, I’d be worried that even at my best moments, I’ve never really pulled ahead of Clinton, instead only drawing to within a point or two of her. I wouldn’t be that worried because it’s not clear how predictive those patterns are. But it certainly wouldn’t thrill me, especially given that the debates make for natural turning points and if the pattern holds, the next turning point will be back toward Clinton. I’d continue to be worried about my ground game, or lack thereof. It’s hard to say exactly how much that’s worth, but underperforming my polls by even half a percentage point in the swing states would make my Electoral College path meaningfully harder. Why Obama Is Still Trying to Pass the T.P.P.